Finger foods usually consist of a variety of canapes and dips. 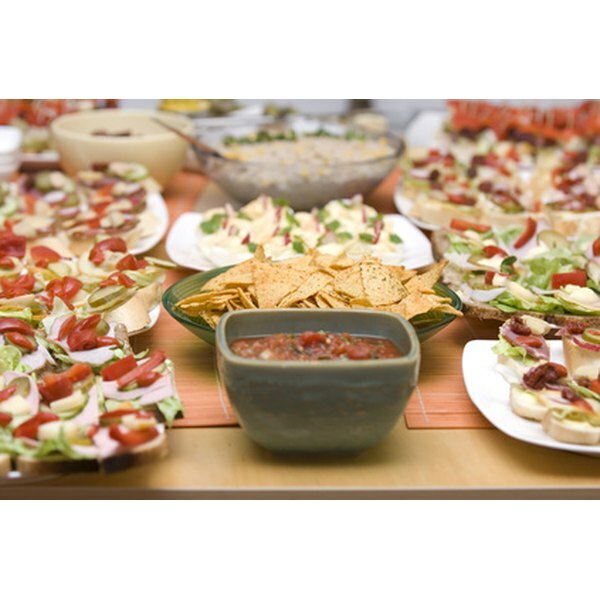 Finger foods are usually the most desirable party foods, as they don't require added utensils and dishes that result in a mess to clean. Finger foods are small, light and allow guests to taste a variety of foods without getting full after their first plate. 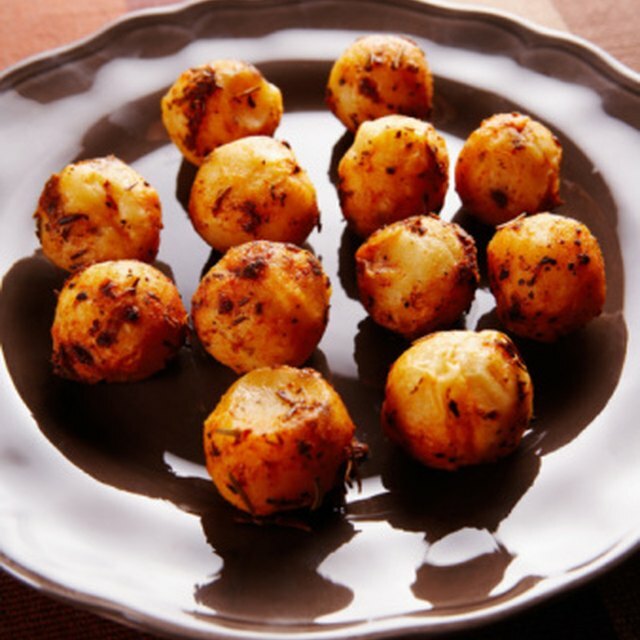 Sometimes called hors d'oeuvres, they can be served at any party or gathering. Tea sandwiches work for any occasion or party. They are versatile and can be made from any style of bread -- white, french, sourdough, seedy or whole wheat -- and can be cut into any shape. Shapes, like hearts or stars, may also be made with cookie cutters. Salad sandwiches work best, as they hold bread together. Turkey, tuna, crab, spinach and egg salad are a few ideas, but any meat or fish salad works, topped with a cucumber or other garnish. Mini quiches are delightful finger food for breakfast or brunch gatherings. They can be made using any favorite large quiche recipe, divided into individual crusts and molded using a cupcake or small tart pan. Make a variety of different meat, cheese and vegetarian flavors. Pie pockets -- similar to pop tarts or hot pockets -- can be made sweet or savory and be consumed entirely with the hands. Pie pockets are small pastries filled with either a sweet fruity filling or a meaty cheese filling. They can be as small as a ravioli or as large as a toaster pastry. To make, prepare large pie dough and cut into small sections, filling each with fruit preserves, sliced fresh fruits and sugar, minced meat, scrambled eggs, ham and cheese or whatever creativity dictates. Seal or roll the edges together and bake. Classic party food, whether intended as a finger food or not, usually includes a variety of dips and things to dip in it. Tortilla chips and salsa, raw vegetables, crackers and bread with spinach, artichoke, crab and bean dips, potato chips and cheese dips are all finger foods that offer variety enough to please nearly everyone in the crowd. Another classic finger food is a platter of cold cuts and dry cured meats, accompanied by a variety of cheeses -- classically known as a meat and cheese platter. Serve small slices of meats on a tray, like turkey, sausages, prosciutto, ham, dry salami and pepperoni along with slices of cheddar, provolone, Swiss, Parmesan, brie, Camembert, goat and Gorgonzola cheese. Pair the tray with a basket of fresh breads and crackers, plus spreads, like flavored cream cheeses, mustards, tapenades and oils. Canapes are similar to open-faced sandwiches; they are small slices of bread, crackers or pancake blinis, topped with a spread or sauce and a variety of cheeses, meats, fish and vegetable. Classic canapes include cream cheese and smoked salmon, mozzarella with tomato and basil and fig with brie and honey. It doesn't get more hands-on than reaching in a bowl for a handful of goodies. One of the simplest finger foods is a simple bowl of pretzels, peanuts, mixed nuts, candy mixes, party mixes or dried chocolate-covered fruits. Most sweets are finger foods aside from large slice, puddings and ice creams. The simplest dessert finger foods include cookies, cupcakes, candies, truffles, mini tarts, brownies and petit fours. Can I Substitute Almond Meal for Bread Crumb Topping?